The thought of acquiring something whimsical, purely for fun, seems to fly in the face of our current era of minimalism. But there’s always room for a few items that simply spark joy. And one way to create a joyful table with color and charm is to augment your everyday dishes and flatware with vintage glass. 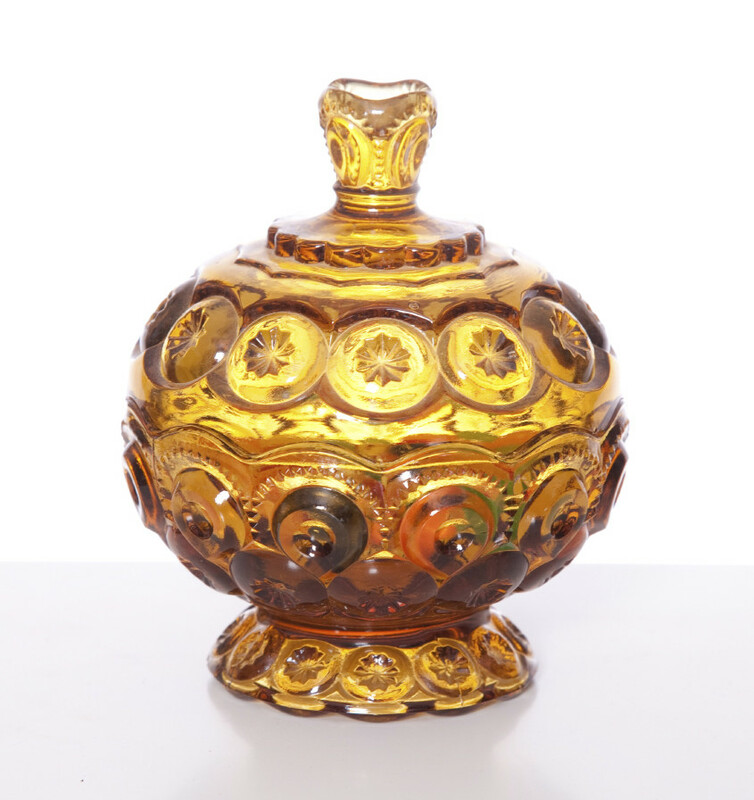 The term “vintage glass” really includes a range of timeframes and styles—from 1930s-era Depression glass, to mid-century modern barware, to 1970s kitsch. But all vintage pieces have one thing in common: they can elevate a mundane contemporary table setting into a fun-filled conversation-starter. You can quickly assemble a wonderful assortment with minimal investment while also having a lot of fun. First, think about the place settings and linens that you already own and the color palette you already have to work with. If your everyday tableware is a basic white or even another solid color, start from there and think about complementary colors to match your dishes and any decorative linens you have. Bear in mind that most vintage glass pieces you will find in antique shops or second-hand stores will be wine, water or cocktail glasses, as well as platters, candy dishes (which can double as serving dishes) and other servingware. Plates are harder to find. So you are looking for fun or funky pieces that will add subtle charm or pizazz to your existing dishes and flatware. Once you have some colors in mind, seek out pieces that speak to you. 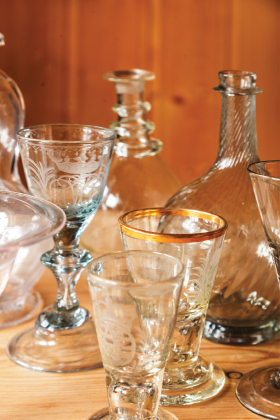 The best place to start your acquisition of vintage glassware is probably in your mother’s or grandmother’s kitchen. Do they have some fun sets of glasses that they keep buried in their cabinets? Ask if they will let you have them. They will probably love to see them used. Or maybe you were lucky enough to have some passed down that you haven’t really considered using. Well, unpack those boxes and see what you have. If you are like most people, you may have a few pieces here and there to start you off. Do you have a bowl of delicate green jadeite that you have always liked, but didn’t know how to showcase? Perhaps some creamy milk glass that you always wanted to use but didn’t know how? Or maybe you have a funky amber glass chip and dip set from the 70s that you think is fun, but nothing else you have quite matches it? Start with those. Then augment these with a selection that you can break out for dinner parties—or even build into a display when not in use. Jadeite and milk glass are two of the more subtle styles that add a touch of low-key charm to your table. 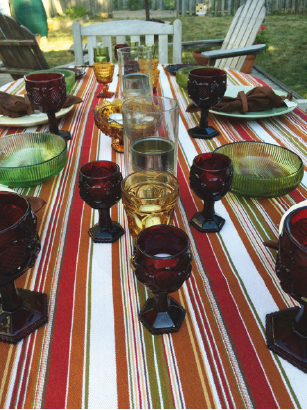 When it comes to color and “pop,” nothing beats Depression glass. 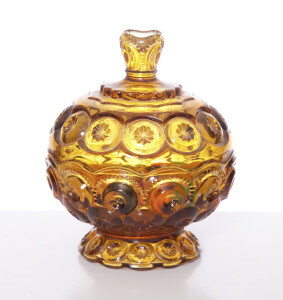 While the name seems to indicate a specific era, the term is more colloquially used to refer to any colorful or cut glass that was popular from a range of eras, from before the Great Depression to long after (although later glassware would have been reproductions of original patterns). Glasses, candy dishes and other pieces of servingware were often given away free as incentives during tough economic times—to lure people into buying a specific brand of oatmeal, for example. You can almost imagine how families would slowly acquire these colorful, sparkling items one at a time until they had a whole set, and how much joy and fun they added to dining tables during lean years. 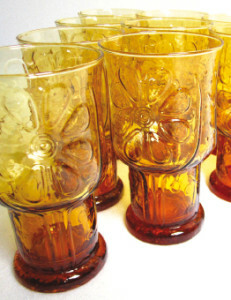 Of course, the popularity of shows like “Mad Men” have also reminded us that having a nice set of “mod” cocktail glasses and pitchers is a great way to create a festive mood for a party. So mid-century modern pieces and 1960s and 1970s items, with their muted greens and smokey blues, bright patterns or silver-and-gold designs, might fit better with your existing dishes. These also tend to include chip and dip sets, ornately designed platters and other fun serving pieces—making them perfect for entertaining. Before investing hundreds of dollars buying a complete set of glasses or other pieces from an antique store, first buy a few pieces here and there to test them out. The best place to find vintage glassware at the lowest prices are local thrift and consignment stores and garage sales. Buy a few items in different colors and see how you like them. You may love a bright green candy dish in the store, but when you bring it home, it might not really go with your table. No worries. For the few dollars you spent, you can donate it back or pass it along to someone else who might like it. As you start to browse for new-to-you glassware, you will naturally find yourself gravitating toward a color palette or design that speaks to your personal style and taste. You can then have a lot of fun browsing for similar styles and colors online, and maybe even tracking down exact patterns or manufacturers you like. Some glassware will have marks—like a stylized L on the bottom for popular Libbey glassware from the 1960s and 1970s. Some you can tell just by the design. You can easily upload an image of a favorite glass to Google Images. Google will scour the web and show you similar images, and you can click around to investigate what you have. Frequent your local antique and thrift stores to add to your collection—and don’t be shy about asking the proprietors to see if they have additional items in back. No store can display all its wares, so even if the shop doesn’t have your pattern or color on display, see if they have any in storage. 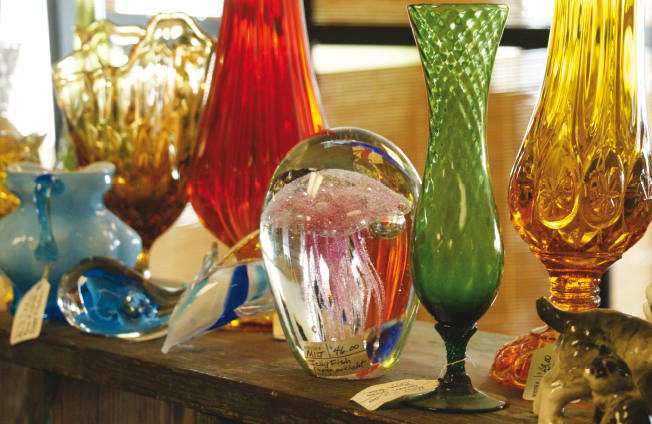 You will quickly find that dealers not only understand their customers’ love of vintage glass—they may also share it and be able to offer some fun history or information on your items. And if they know you are looking for certain pieces, they can also alert you when they acquire them. Collecting vintage glass is a fun and inexpensive hobby that allows you to add unique charm and personality to your tabletops. Collectors will tell you that the only downside is finding enough cabinet space to store your newly acquired gems.